It's not as overdue as a PR agency winning the PR Grand Prix at Cannes, but we have been slow to give the creative side of our industry the same recognition online as we do in print. 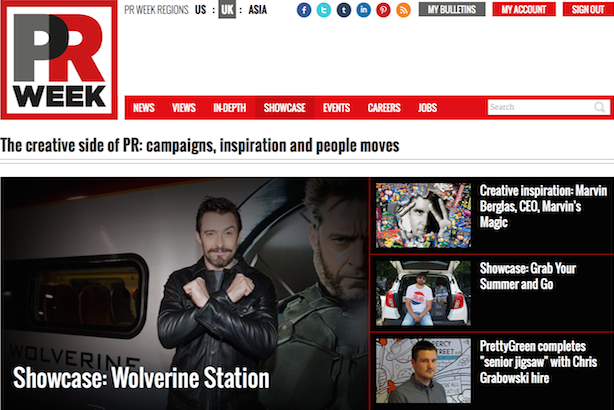 That has changed today with the arrival of the new Showcase section [find it in the top navigation bar after Views and In-depth] on PRWeek UK. But there’s more: in our News section we’ve added a page for our coverage of Cannes, which starts on Sunday. This is where you can follow developments from the International Festival of Creativity as PR agencies continue to elbow their way into the centre of the crowded marketing services arena. Monday will be the key day, with the PR Lions awards ceremony in the evening, as well as the PR Young Lions competition, in which Weber Shandwick’s Leila Sloan and Kate Mountford are representing the UK. We’ll bring you the news on the winners and follow throughout the week to see whether PR agencies manage to claim any scalps in the other categories, such as Cyber, Innovation and Integrated. And for the full-on experience of the daily bunfight of ideas and celebs [Patrick Stewart – check, Jonathan Ive – check, Sarah Jessica Parker - check] our sister magazine Campaign is a running a live blog. Good luck to all those taking part – and remember to submit your best campaigns to our Showcase section, whether they were carried out in the UK or elsewhere in the world, via jonathan.tilley@haymarket.com.